Did you have a corresponding gasket deterioration and possible water pathway in the shown circled zones where the head was pitted? The imperfections of the casting may also be responsible for preferred water pathways and localised corrosion. alpa a écrit: I did not get answer from Regina, not surprising, Maseralfa explained in Italy you have to call before writting to them . He'll try as a professional, he owns a parts business. alpa a écrit: Your head looks like having had strong ping, ping melts down the surface. But it usually happens on pistons, not on the head. At least I have not seen such case but I don't have so much experience with this. Check piston crown when it's in TDC. These heads are extremely well designed so they are very well cooled. And pistons are forged. So it may be OK after some cleaning and surfacing. I've checked the piston, haven't noticed anything, but it's covered in crud, might be that it has a small missing piece? Will try to clean it and check again. alpa a écrit: Valves are OK and yes they are close to the surface but this is how F1 heads are . It's written Coscast, not a mistake, it's Cosworth. Head oxydation is not unusual on old engines. You'll see more once surfaced, removing 0.1mm may suffice. 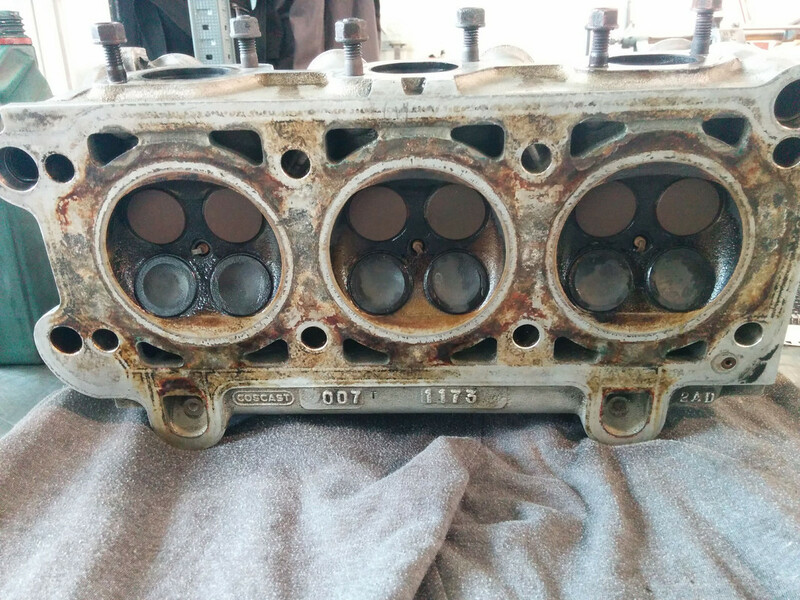 Does this oxidation that mean that gaskets are not designed for such a long time? Or improper coolant? Or if the car is running rare the corrosion inhibitors are not flowed properly through the engine? I'm just guessing here. alpa a écrit: Note that valve seats are very special (round shaped like on F1 engines, not angled) so don't allow any wanker to work on them. There is only one angle on them. So it's not simply the traditional 45 degrees cut as the manual writes for recentering the seats when changing guides? Froggie a écrit: Did you have a corresponding gasket deterioration and possible water pathway in the shown circled zones where the head was pitted? 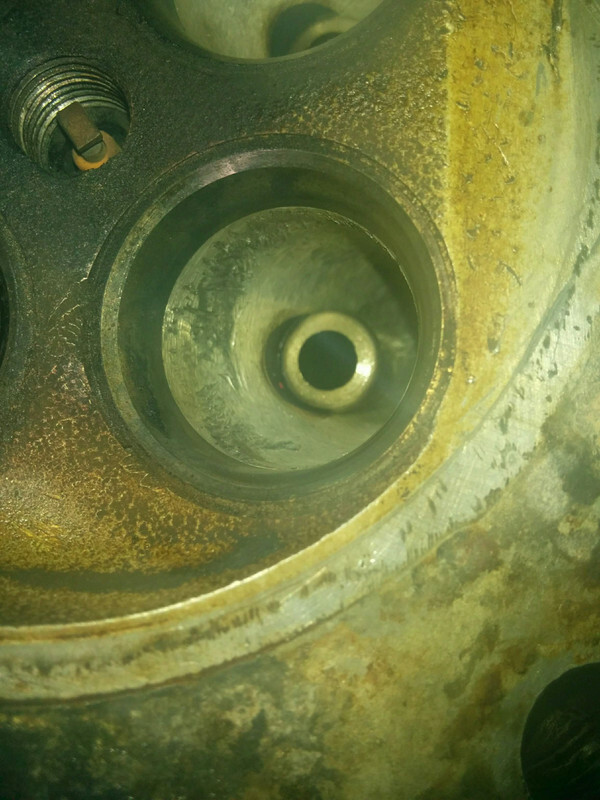 Yes, the pittings are at the worst gasket deterioration areas where the coolant seeped through (slightly visible on the first picture). With some help I've removed the valves. There is definitely carbon buildup on the exhaust seats contributing to the leak, which was also verified before disassembly using liquid. The damage in that combustion chamber is from a foreign object, marks also visible in the intake port. This will be smoothed down. There is noticeable play in exhaust valves / guides. The guides will be replaced, and since I also have the inlet guides those will be replaced as well. 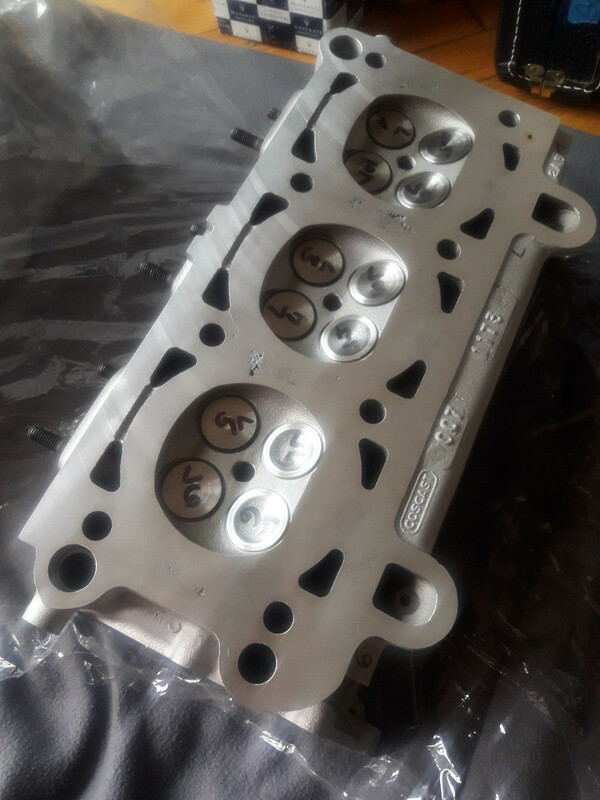 The heads have been sent to soda blasting, hopefully next week going over to the machining shop for resurfacing, replacing guides and recentering seats. Thank you for sharing, interesting pics. The carbon buildup looks important indeed. Anyway now that it's open, head resurfacing + guides' replacement + valves' seats cleaning, you will recover a fully tight head . Gaskets are not designed to last forever, like any part. But not changing the coolant of course makes things worse. Also not using the engine accelerates oxydation because this lets time to air pockets to react with coolant and metal. Cosworth is one of best engine designers in the world. Their casting is one of the best. It's a real race engine company. 3200gt heads are even better from the flow point of view. Such small damages can be due to a broken compressor wheel, this makes tiny pieces that are smashed and melted down in the chamber. 800-900C are enough to make them disappear. Finally got back the heads. - Guides were replaced, the new guides had to be drilled out first before reaming because the valves didn't fit, their internal diameter was 6.5mm. - Finally resurfaced. This removed most of the pitting on the Right side, some still remained on the Left side. but this is where my problem starts They had to take down 0.3mm because they were not flat, but factory limit is 0.2mm. Ok compression will increase slightly more, but the bigger problem is that I think they didn't properly level the Right head and even cut into the seating area (middle grey area) of the valve seats. Also apparent because on the Right head the casting numbers on the side are slightly cut, but not on the Left head. I think your correct exhaust seats should be at least 1.2mm wide. If in the cut area you still have 1mm it's ok, if it's 0.5mm then I'd hesitate. Valve width is for the flow but also for valve cooling. So having such small nearow area isn't a problem I think, but it should be let's say 0.8mm wide. Worst case just recut seats more. 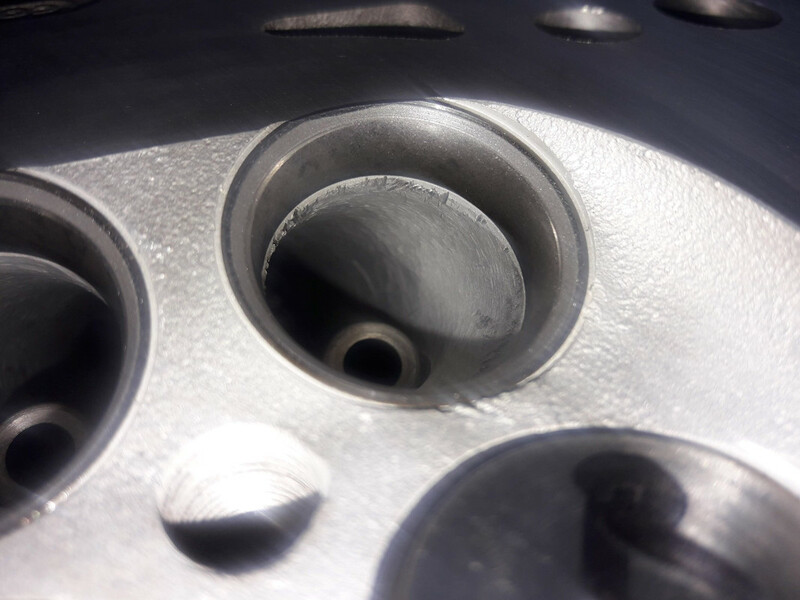 Exhaust valves flow better than intake, you won't impact performance. Did they do a small second cut under the main one ? Not sure it improves anything, otherwise Cosworth would have done that. 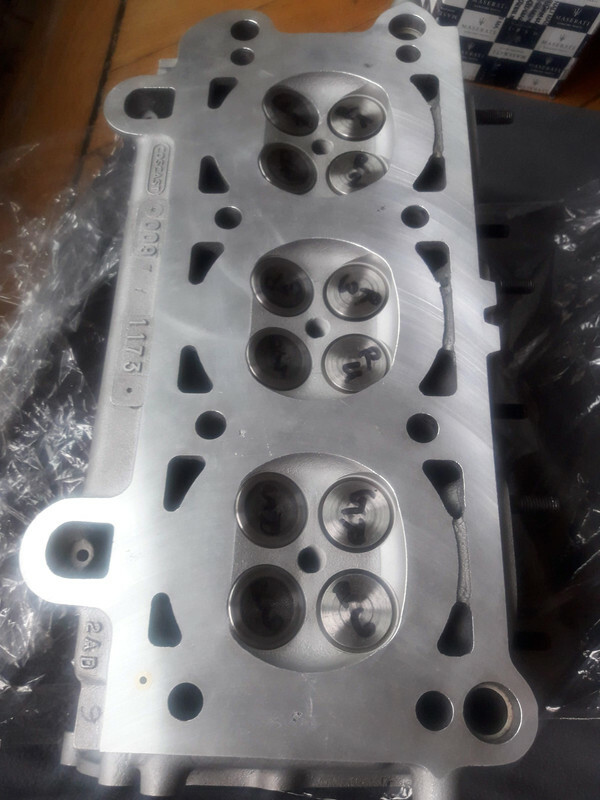 Pity, and strange that tolerances (0.2 mm) are that thin for resurfacing the head to maintain an acceptable area for the valve seats. Seems from your pic that the seat width is about 3/5th of the nominal width, so 0.7-0.8 mm thereabout (to be checked). And the constriction looks limited to a small area. Thanks for the suggestions. I've measured and it's 0.8-0.9mm. I was also more concerned because of the cooling, but indeed it's not a very wide part compared to the whole seat. I'm a bit revealed based on your inputs, I'll probably go ahead and mount them this way. They only cut the factory suggested 45 degrees, no second or third cut below and above. But before mounting the heads, I'll open the bottom to check the condition of the bearings and the rings. Since the engine is already apart I decided to check everything now instead of having to open the engine later. As I know that the bottom is quite strong, except the main bearings but at least I will know how everything relates to specs. spacecadet a écrit: But before mounting the heads, I'll open the bottom to check the condition of the bearings and the rings. Since the engine is already apart I decided to check everything now instead of having to open the engine later. As I know that the bottom is quite strong, except the main bearings but at least I will know how everything relates to specs. Be prepared to replace main bearings. You can do replace only half of shells, the top ones are usually intact so just change the bottom ones. There is only one class for bearing so they are all the same, no problem to mix new and used if the used ones look new.